RANCHO CORDOVA, CA (MPG) – Got Biz? Then you put August 16 on your schedule for the annual Rancho Cordova Chamber of Commerce Business-to-Community Expo. The food is free, and so are the handshakes. This is the perfect opportunity where businesses and organizations showcase their products and services to residents and businesses of Rancho Cordova and the surrounding areas. Attendees and exhibitors alike will enjoy the networking with people from the community, fellow exhibitors, local business owners, and city and county leaders throughout the day. Last year over 700 people attended the four hour event. The Expo provides exceptional value for your marketing opportunities and a great way to introduce yourself to neighbors. The Business Expo brings together nearly 100 businesses with a wide variety of goods and services from all over the region. It features interactive exhibits, along with local restaurants and caterers providing food samplings throughout the event. Admission is free, and so is parking. The 8th annual Biz Expo takes place on Thursday, August 16 from 10am – 2pm at Rancho Cordova City Hall located at 2729 Prospect Park Dr. The event is free to the public. 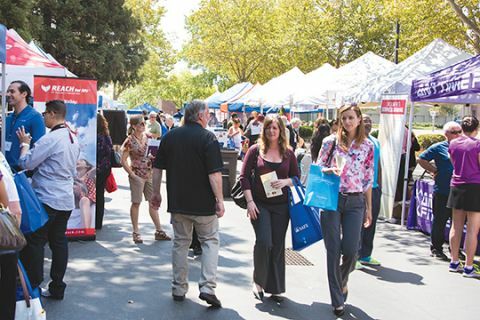 Visit ranchocordova.org/rancho-cordova-business-expo to purchase a booth or for more information.